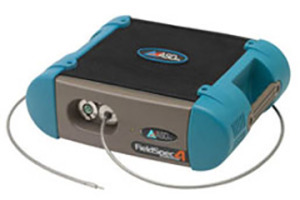 Optimizing your time in the field with ASD’s fast, precise field spectroradiometers. The gold standard in field spectroscopy, the FieldSpec line of portable spectroradiometers features technical, durability and mobility enhancements to help researchers accomplish more work in less time and with greater accuracy. 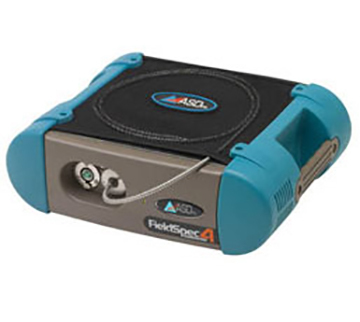 Ideally suited to meet the needs of today’s researcher, the FieldSpec®4 Standard-Res portable spectroradiometer offers ASD’s state-of-the-art remote sensing technology with dramatically improved speed, performance and portability over previous models. This full-range Vis/NIR (350-2500 nm) portable spectroradiometer features enhanced capabilities in the SWIR 1 and 2 regions, as well as double the signal-to-noise performance, allowing you to cover more ground without losing any data quality. Improvements in the SWIR 1 and 2 regions allow researchers to cover twice the area in half the time as the FieldSpec 3. New spectrometer configuration provides double the signal-to-noise ratio performance as previous ASD portable spectrometers. New ruggedized fiber optic cable and a compact, impact-resistant case make the FieldSpec 4 Standard-Res field ready and highly portable. The FieldSpec 4 Standard-Res spectroradiometer, with a 10 nm resolution at 1001-2500 nm, comes in a mobile package with a small, lightweight, impact-resistant case and a convenient backpack travel cover. A new ruggedized cable protects the fiber optics, nearly eliminating fiber breakage. An expanded wireless range adds flexibility by helping users capture spectra farther from the instrument controller. The FieldSpec 4 spectroradiometer is ideal for a wide range of applications, including hyperspectral image interpretation, crops and soils research, and radiometric calibration. The new standard in field spectroscopy, the FieldSpec 4 line of portable spectroradiometers features several enhancements to help researchers accomplish more work in less time and with greater accuracy. Foreoptics control the field-of-view and maximize data collection to better meet specific application requirements. 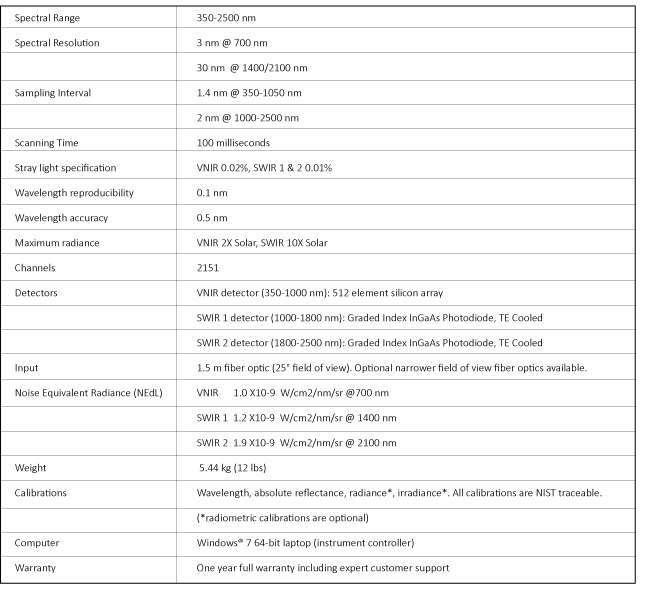 A wide selection of foreoptics lenses are available for use with the FieldSpec® 3 and FieldSpec® HandHeld 2 spectroradiometer systems. 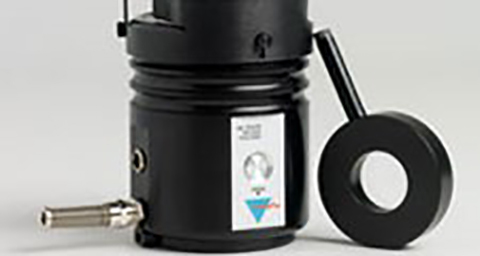 For non-destructive contact measurements and characterization of mineral and ore samples. 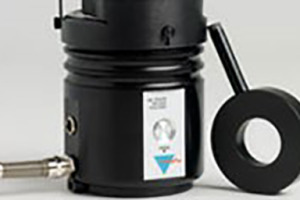 Designed for analysis of raw materials requiring reflectance and absorbance measurements of minerals and some inorganic material applications requiring a higher intensity light. Use with ASD’s family of Contact Probes for non-destructive, one-handed functionality, and improved analysis of live vegetation and other thin heat sensitive targets. 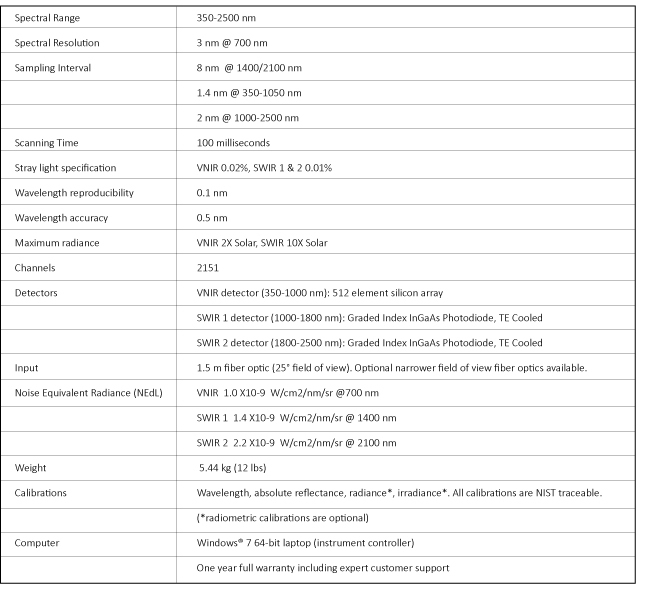 Reference panels are available in calibrated and non-calibrated diffuse white and gray, in varying sizes and reflectance levels, including encapsulated gray scale (NIST/NRC traceable) wavelength and USP standards for USP 1119. 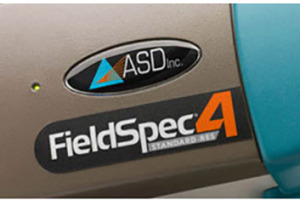 For more information on The FieldSpec 4 please visit our Knowledge Center. The FieldSpec 4 Hi-Res spectroradiometer has been designed for faster, more precise spectral data collection in remote sensing applications. The enhanced spectral resolution offered by the portable, ruggedized, high-resolution spectroradiometer is well suited to geologic applications and other fields of research that require definition of narrow spectral features, especially in the longer wavelengths. Faster spectral collection speed by allowing researchers to measure more targets at more sites in a smaller timeframe. 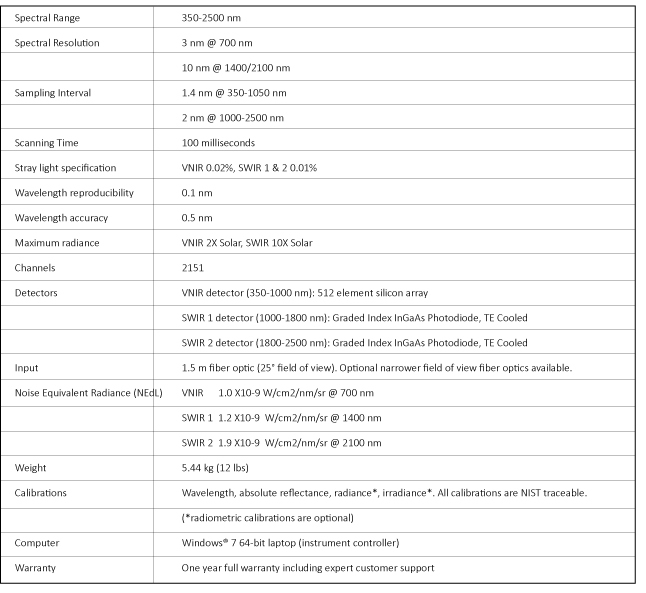 The full-range (350 – 2500 nm) Vis/NIR FieldSpec 4 Hi-Res provides the highest spectral resolution available in a portable, ruggedized field spectroradiometer. An extended wireless range presents new opportunities in research supervision from longer distances. New ruggedized fiber optic cable and a smaller, lighter, yet tougher case make the FieldSpec 4 Hi-Res field ready and highly portable. 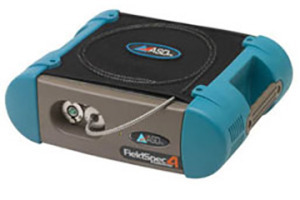 The FieldSpec 4 Hi-Res spectrometer has increased signal throughput, improved spectral resolution and vastly improved signal-to-noise ratio over previous ASD field spectrometers. For remote sensing, this means faster spectrum capture in the field with improved spectrum quality. Researchers looking at materials at longer wavelengths—such as carbonates, clays and chlorites—will benefit from a 2X radiometric performance increase in the SWIR 1 and 2 regions. The FieldSpec 4 Hi-Res spectrometer, with an 8 nm resolution, is also ideal for building spectral libraries, since it provides the high spectral resolution spectra required to support current and planned hyperspectral sensors. Ideal for geologic applications requiring mapping of alteration mineralogy, the FieldSpec 4 Hi-Res spectroradiometer is also suited for hyperspectral image validation and ground truthing. Ideally suited for support of multispectral remote sensing studies and analysis of materials with broad spectral features,the FieldSpec 4 Wide-Res spectroradiometer offers dramatically improved speed, performance and portability over previous models. The full-range (350-2500 nm) remote sensing Vis/NIR spectroradiometer features enhanced capabilities in the SWIR 1 and 2 regions, as well as double the signal-to-noise ratio performance. This allows you to cover twice the ground in half the time without any loss of data quality. A 2x improvement in SWIR 1/SWIR 2 performance means researchers can capture the same quality of spectral data in a quarter of the time. Take the same number of average scans, but enjoy better quality of spectral data. 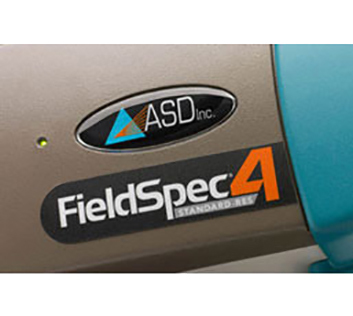 The FieldSpec 4 Wide-Res’ improved signal-to-noise ratio equals more precise spectral data. A wide-resolution spectroradiometer, the FieldSpec 4 Wide-Res captures spectra with 30 nm resolution, making it the preferred choice for measuring materials with broad spectral features. Remote sensing applications include plant physiology, agronomy and forestry, as well as light energy measurements, photonics, light source studies and multispectral ground truthing. 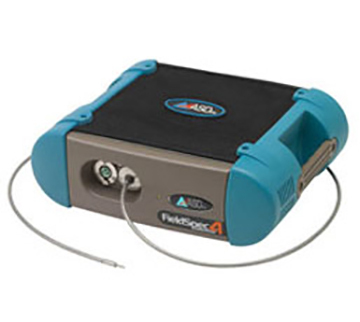 Built to function in extreme environments, the FieldSpec 4 Wide-Res fiber optic spectrometer has a lighter, smaller case, a convenient backpack travel bag and a ruggedized fiber optic cable that ensures uninterrupted signals during rigorous field applications. An expanded wireless range permits fiber optic spectrometer measurement farther from the instrument controller. The combination of improved portability, rugged construction and faster spectra collection helps researchers move from site to site more quickly to maximize narrow field research windows. 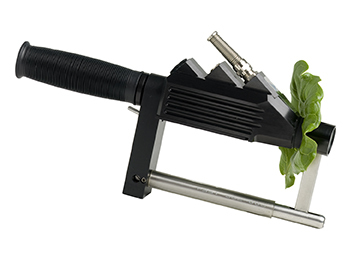 For non-destructive contact measurements of live vegetation leaves and other heat sensitive targets.